A review of a new English-Zulu glossary of historical architectural terms. 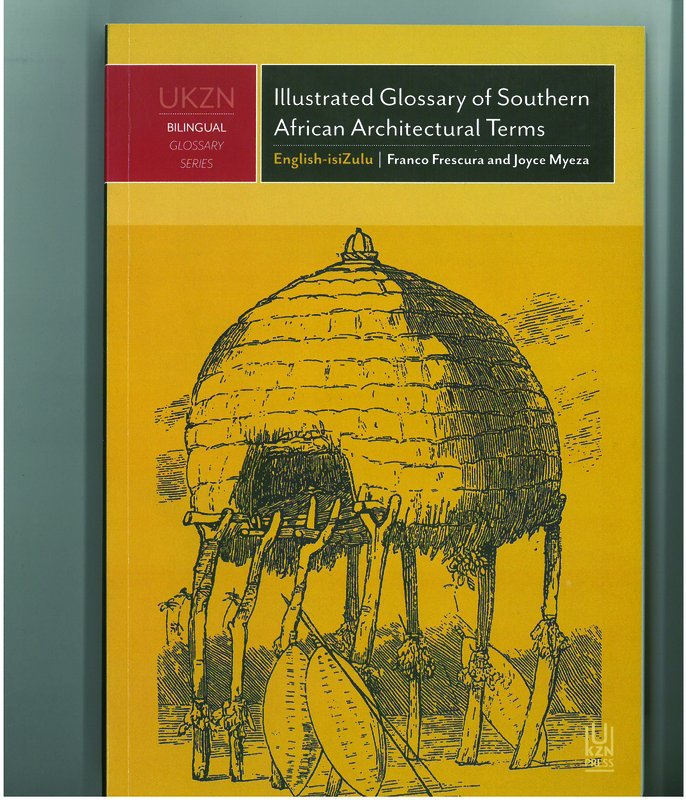 The publication of this bilingual glossary, subtitled ‘an illustrated survey of historical terms appertaining to the indigenous, folk and colonial architectures of Southern Africa’, raises a number of interesting questions or arguments. Frescura – who was Professor and Chair of Architecture at the University of KwaZulu-Natal and has lectured in Europe, North America and South-East Asia − has been expanding the research for this book since the late 1970s, and it’s comprehensive even if it does miss a trick or two. The illustrations, which let the reader see and imagine the architectural elements being described and introduce the vernacular architectures presented, are effective. Despite being from a variety of old and new sources and draftsmen/women, the illustrations are visually consistent and carefully chosen − not only for their didactic uses but also for their uniformity. So, is this a straight-forward bilingual English-Zulu dictionary of architectural terms? The answer must be a negative, if only because the choice of language(s) is never simple − especially not in South Africa. Here the choice has been determined by the needs of the publisher, UKZN Press, where undergraduate architectural classes are now taught in Zulu, ‘as the first step to providing students originating from an indigenous isiZulu-speaking background with the support that will give them ready access to a specialised lexicon not commonly found in either home or working environment’. Equally, the book would introduce the non-Zulu speakers to both the lexicon and to vernacular built forms. To explore this, I asked University of Cape Town architectural students what they thought of the book. I spoke to first and third years – with no response. I thought this may be owing to the preponderance of Xhosa amongst the UCT students, not Zulu, but the studio masters suggest it’s because students are interested in contemporary architecture rather that in vernacular or historical architectures. Nevertheless, the book should be a useful companion to Paul Righini’s 1999 Thinking architecturally. If architects are like these students, and I suspect so, the book may not find many architect readers outside of KwaZulu-Natal. But perhaps the most interesting question about (and function of) this book is an implied one interrogating the complex overlapping of language and built form, and the relative effectiveness (or usefulness) of each in manifesting culture and the gradual loss of linguistic forms as built vernaculars are lost or eroded. If the book is used as extensively as the writers and publisher would hope in Zulu-speaking environs, it could − even should − contribute to a recovery of disappearing linguistic and built vernacular forms. There are some surprising omissions from the lexicon: words referring to recovery, like preserve, conserve, restore, authenticity, cultural significance and meaning. In the current climate, ideas around cultural and built heritage − the significance of the built environment − are perhaps the most interesting and exciting. In a less charged political context, these ideas are also part of everyday architectural language and thinking, as argued by Amos Rapoport in The meaning of the built environment (1982). My two concerns apart, I suspect that the subject matter, as the authors imply by referring to Rapoport’s 1969 House form and culture, may be of greater interest and use to archaeologists, anthropologists and ethnographers. Indeed, the relationship between Iron-Age archaeology and vernacular architectures is better recognised in these fields. While not quite a companion, the glossary could be an interesting adjunct to Martin Hall’s comprehensive Archaeology Africa (1994).